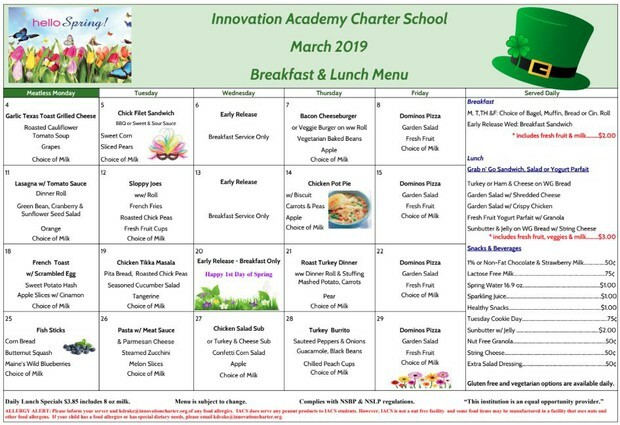 It’s been a full week at IACS! One of our annual school goals is for 100% of IACS advisories to participate in a community service project. This week all middle school advisories participated in a wide variety of service projects. Some examples including lead activities at area nursing homes, filling donation bags at Merrimack Valley Food Bank, doing clean-up projects at House of Hope and Nashua Soup Kitchen, and working with the MSPCA and Lowell Humane Society. This work connects to the overarching objective of building a sense of belonging among students and nurturing students that are positive contributors to their school and community. If you haven’t already heard about your child’s project, please ask them about their service work. Kapeckas Advisory Students doing crafts with the residents at the Atrium at Drum Hill. Today, several students and staff members traveled to Worcester Polytechnic Institute to represent IACS at DynamiQueSt. This annual event aims to help students further their understanding of systems thinking with simulations, workshops, and sharing of student work. 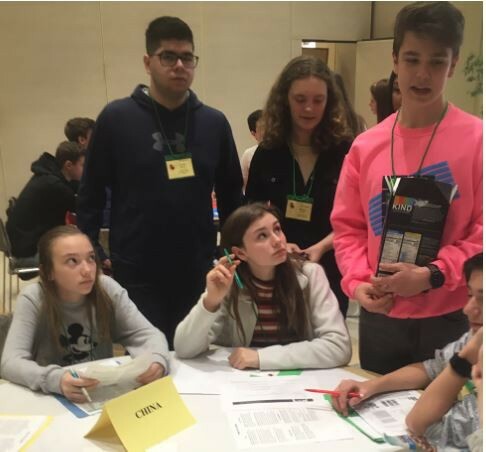 Below is a photo of some eighth grade students simulating a world climate change negotiation at DynamiQueSt. 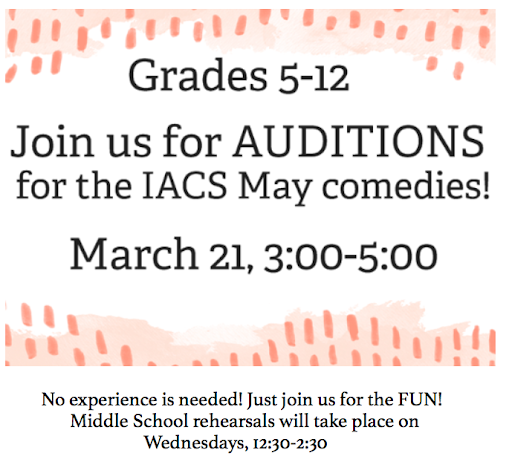 Spamalot opened last night and it was the talk of IACS today! There are remaining performances this evening at 7pm and Saturday, March 16 at 2pm and 7pm. Tickets are available by searching "Innovation Academy" on eventbrite.com or by following the link at innovationcharter.org/theater or at the door. 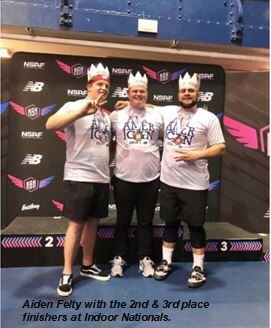 And, finally, we’re celebrating senior Aiden Felty’s win at last weekend’s national indoor track championship in the shot put. We’re all so proud and excited of Aiden’s commitment and drive that helped him earn the national championship. Congratulations Aiden! The Caffrey, Krakauer, Destramp, Bresnahan advisories have already won a pizza party, and you can too! Congratulations to IACS Archery League Champions Team IACS Hawks! 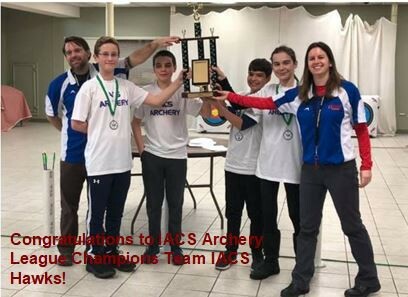 The IACS Archery program completed a very successful year and was able to send two teams of archers to the league finals. The IACS Hawks won the league championship and multiple archers won individual accomplishment awards. Congratulations to Sawyer Morgan, Tim Panilaitis, Alex Grove, and Emily Hanlon for bringing home the championship trophy! The first progress reports for Semester 2 were published to our x2 Aspen student and family portal today. 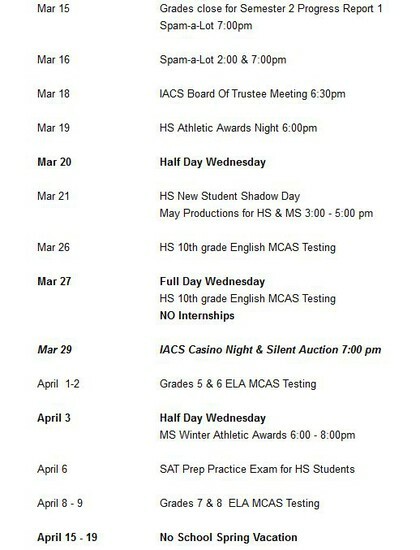 Please log on to the portal to review the progress report with your child. If you need your password or your account needs to be reset, please reach out to the main office. The first Progress Report for Semester 2 should be available for viewing in the Aspen Family Portal on Tuesday, 3/19 and students will be given a paper copy during advisory as well. Ask your student to see it! If you are having problems accessing Aspen, please contact Crystal McKiel at cmckiel@innovationcharter.org or x2004. Reports card are not mailed to parents unless requested. This past Saturday Aiden Felty competed in the Indoor Track and Field Nationals Meet in New York City. Coming down to the very last throw, Patrick Piperi of Texas was the current leader at 66’ 3”. On the very last throw of the meet Aiden threw 66’ 8 ¾”. This throw won him the meet and he became the National Champion! Throughout the season, Aiden has been a dominant thrower; breaking both the Massachusetts State and New England shot put records. He also holds the top 10 throws of all-time in New England. We are very proud of what this young man has accomplished and we are excited to see how this last season as an athlete for our school unfolds during the outdoor track season! Congratulations to Shelby Sylvain and Abby Kelsey for being recognized as our new Seniors of the Month! Shelby has been busy with the Cheerleading team, planning her senior project and also helping Ms. Deknatel educate the freshmen about the importance of having a good start in their first year of high school. Abby does an excellent job balancing her school work, chorale, and performing in the school theatre productions. Come see her next week in Spamalot! Both Shelby and Abby are kind and thoughtful classmates that always (almost always) have a smile on their faces that brings a real positive energy to our community. Congrats again to Shelby & Abby! Bus tickets for the Lowell Regional Transit Authority are on available to purchase for $1 per ticket. See Dr. Arnold or Crystal to purchase. Monthly passes are still only available from the Gallagher Terminal in Lowell. CASINO NIGHT – Selling out quickly! There are only 4 tables left! 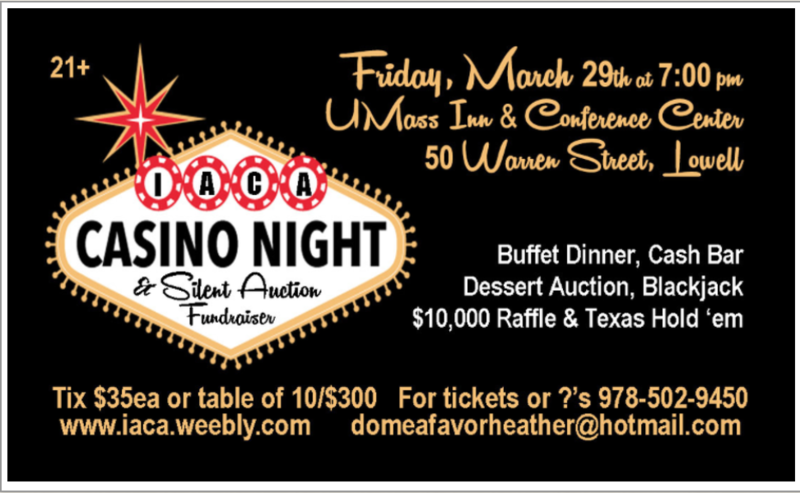 Pick up your tickets now for our annual Casino Night, to be held at the UMass Inn and Conference Center on March 29. (this is a 21+ event) Tickets are just $35, or grab some friends and fill a table (10/table) for $300! 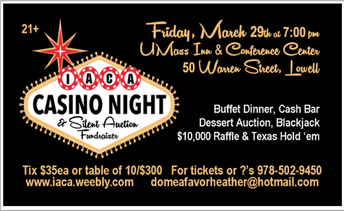 This fantastic night of fun includes a buffet dinner, Casino games (for fun) silent auction and live dessert auction. Contact Heather Landis to purchase tickets – 978-502-9450 or domeafavorheather@hotmail.com Hope to see you there!